This is a hot young salon in Hell’s Kitchen looking for a new owner to take it to the next level. The space is gorgeous, the staff is amazingly talented and friendly, the online reviews are raves and there is plenty of space to expand services. There are 14 styling stations, four shampoo stations and three under-utilized treatment rooms ready for new services. From the chandeliers to the upholstery this salon screams upscale style. 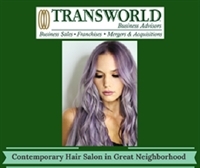 Plus, it is currently the only salon within 10 blocks on this avenue in one of the fastest growing neighborhoods in Manhattan. Hundreds of new apartments are under construction and soon to open within that 10-block area. Hours: Monday-Friday 11AM–8PM, Saturday 10AM–7:30PM, Sunday 11AM–6PM. Lease: 2,200sf on ground floor plus full basement. Rent is $12,000/month including real estate taxes. 3% annual increases. Seven years remain on the 10-year lease. The Transaction: The deal structure will be an asset sale. The reason for sale is the sellers’ desire to focus on other business. Owner will train for two weeks at no charge. This business is offered at $1,200,000.